A superstructure block of a very large crude carrier (VLCC) being built by Hyundai Heavy Industries (HHI) slipped from a barge and sank on September 15, while underway in Ulsan waters, Yonhap reports. As informed, the huge block was underway toward HHI’s manufacturing facility in Ulsan, South Korea, when it fell into the water. Yonhap said that the structure in question is in fact the deckhouse of the vessel, spanning 60 meters in length, 21 meters in width and 38 meters in height, and weighing 917 tons. The structure was being transported on a 3,680-tonne barge, towed by a tugboat toward HHI’s Ulsan yard. There were four people on board the tugboat and one on board the barge when the incident occurred, fortunately, they are all reported to be safe. 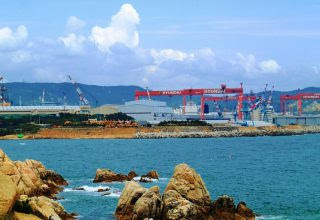 Hyundai Heavy Industries plans to send a diver to the site to assess the situation of the mega block, before moving ahead with the salvage plan, Yonhap added.